One of the things that you can expect for him to do is to profess his ownership. Now there are multiple ways that he will do this. First, he will give you a title. Why? Because he knows that other men use titles to categorize women. Yep! We don't have to know your government name but we know what category to put you in. We use a title to let others know how we feel about you. Next he will openly profess his feelings to others whether they ask for it or not using the title that he's given you. It's the difference between saying she and I are dating or "kickin' it" and saying she's my girlfriend/fiance/wife. This particular action is shown before you guys get serious as a courting gesture. It can also be used as way of showing his wealth. When a man asks you out on a date and he pays for everything, he's showing his ability to Provide for you. Now after you guys have been together for a while and he starts to pay for not just his bills but yours regularly also, he's showing his willingness to provide for you two as a family. That's what you want to look for. You two moving in together before marriage is also an example of this as long as he's paying the bills or you guys are splitting them. This third action is more primal and it's what the previous two are derived from. It's our innate need to protect what's ours. Because it's a man's instinctual/selfish nature to protect what's his, he lets others know that something belongs to him by giving it a title that others recognize. Then he provides to show it that he's committed and wants it to last. And most of all, a man protects what is his. Now, there are different levels of protection of course. And each is definitely noticeable. When he's courting you, putting his hand on the small of your back and walking on the curb side of the street are examples of his protection. 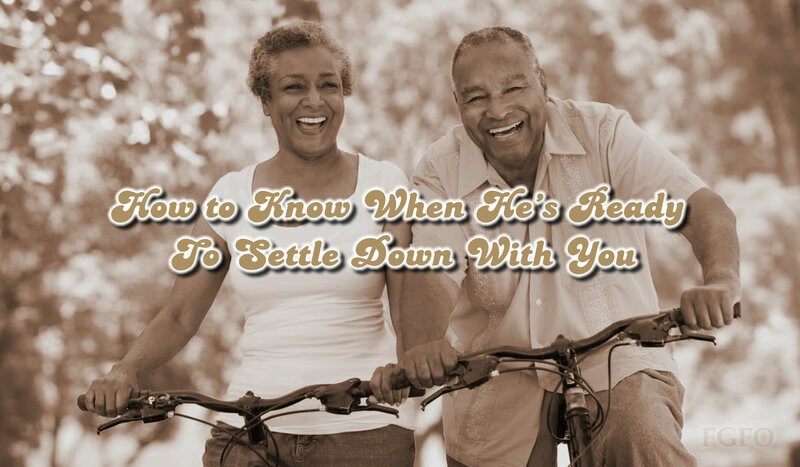 When he's ready to settle down with you some examples of his protection are buying you a house or place to live in together, not letting you go to as many places alone, and sacrificing his needs to make sure that your needs and wants are met. Did you notice the recurring similarity among all of the points that I made above? It was selfishness. We are naturally selfish beings, us men, so many of the things that we do are selfish but not all bad. It's that selfish nature that our desire to marry you comes from. I talk about that more in the post about why You'll Never Have His Unconditional Love. Click that title to read it. Single ladies, Divorced ladies, Engaged ladies, All ladies! This is some good insight when trying to determine if he's the one. The problem is, you have to let him show you the signs. For example, many women are capable of taking care of themselves financially and have been doing so for a while. Our independent nature often interferes with a man's ability to show his desire to provide. This is the case more often than not with women who make more money than the man they're dating. Turn down the volume on your "I'm a strong woman taking care of business" station for a moment to hear what he's saying and doing. And that's my 2¢.